You’ve heard the buzz… the Bruce Peninsula is THE place to be! Its spectacular beaches, wild and rugged natural spaces and incredible Georgian Bay vistas beckon. Whether you come in search of the quiet and serenity of nature or the excitement of rock climbing, kitesurfing or cycling, the Bruce delivers on everything you’re looking for (and offers some great surprises, when you get off the beaten path!). But what do you need to know to plan the best Bruce Peninsula road trip possible? Keep this post handy as you plan and prepare, as it contains important travel tips, contact information and links to more resources that will help you have the best experience as you Explore the Bruce. Bruce Peninsula’s west coast offers spectacular sunsets, sandy beaches and a great variety of shoreline flora. Beaches are typically shallower and warmer on this side of the peninsula, making for better swimming if you visit early in the summer season. There are a ton of places to put in your kitesurfer, canoe or kayak on the Lake Huron side, and marinas in Sauble Beach and Southampton for boaters. On Bruce Peninsula’s east coast, you’ll find the deep, crisp blue waters and rocky shoreline of Georgian Bay. This is where you want to be for deeper water boating and fishing, scuba diving and colder water swimming. Be sure to use Explore the Bruce’s Boating & Paddling Guide and Beaches Listings to make sure you don’t miss a thing on either shore! Bruce Peninsula offers all kinds of accommodations, from hotels and campgrounds to AirBnBs, private cottage rentals, and bed and breakfasts. You can even find shared accommodations at the region’s first hostel, The Fitz in Lion’s Head. The Bruce is a popular place to be in peak summer season, so you’ll want to book as far in advance as possible. Check out Where to Stay to get started. Activities and adventures can be booked ahead, too. See Things to Do or order your Bruce Peninsula Explorer self-guided tour ahead of your trip to see which activity options are on your route so you can book in advance. You’ll definitely want to book parking ahead of time online if you plan to visit the Grotto, and can do so online here. Public transit on the Bruce Peninsula is sparse. You can get here by car, or via the Parkbus which picks up in 3 Toronto locations and drops off at 4 destinations on the Bruce Peninsula. Learn more about Parkbus service here. Drive carefully on your Bruce Peninsula adventure! The speed limit on Highway 6, which runs from the base of the peninsula at Wiarton all the way up to Tobermory, is 80km/hr. In villages and inhabited areas, the speed limit is 50 km/hr unless otherwise marked. This speed limit is strictly enforced by OPP and aerial patrols. Highway 6 is a hilly, winding highway with no passing lanes and few opportunities for safe passing. Get comfortable, be patient and respect the speed limit over the course of your trip. Please watch carefully for wildlife! The Bruce Peninsula is one of Southern Ontario’s last wild regions and as such is home to a great number of species including turtles, snakes, rabbits, porcupine, coyotes and even bears. Turtles in particular are having a rough year across Ontario and need extra time to cross our roadways. Slow down for animals. Use your caution lights as you are slowing to alert other drivers to your change in highway speed, and pull off the roadway fully onto the shoulder, if necessary. Use public restrooms where they are provided--avoid the public embarrassment and potential fines of using our outdoor spaces as a toilet! Popular destinations including Tobermory, Sauble Beach, Southampton beach and Bruce Peninsula National Park offer public restrooms, and most businesses provide facilities for customers’ use. To find a list of the surrounding public facilities, use this map! Explore the northern tip of the Bruce Trail, all the way to The Cairn in Tobermory. The main trail runs about 160km from Wiarton to Tobermory and offers side loops to explore in every season. Always make sure you have the most recent map with you--you can order the Reference Guide and Trail Maps as well as download the Bruce Trail app from the Bruce Peninsula Bruce Trail Association. Explore the Bruce offers a comprehensive list of gear and accessories you should pack to bring with you. It’ll also help prepare you for the plants, wildlife and insects you might encounter in your travels. Read more here. Finally, follow hiking best practices to ensure you have a safe, enjoyable time on the trails here on the Bruce Peninsula. Never go hiking alone, and always carry a supply of fresh water and high energy foods with you. Give a trusted friend or family member a copy of your route and anticipated return time, so they can alert the authorities if you run into issues. 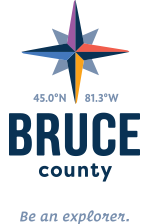 Plan to stop in at a Visitor Information Centre to kick off your trip with the most up to date information about the places you plan to visit, activities you want to do, and things you want to see on the Bruce Peninsula. Let’s get your Bruce Peninsula adventure started! Get off the beaten path and go deeper. Plan to stay longer. See more of the Bruce Peninsula with each trip. The 2018 Explore the Bruce Passports are out now, and there are fantastic prizes to won as a result of your travels.